Today is beautiful, like most days before a storm or a disaster strikes. Since I’m going to a presentation of Lou Reed’s “The Raven” after work, a big, fat lunch is in order. Brooks 1890 is the tonic I need: excellent Italian food. 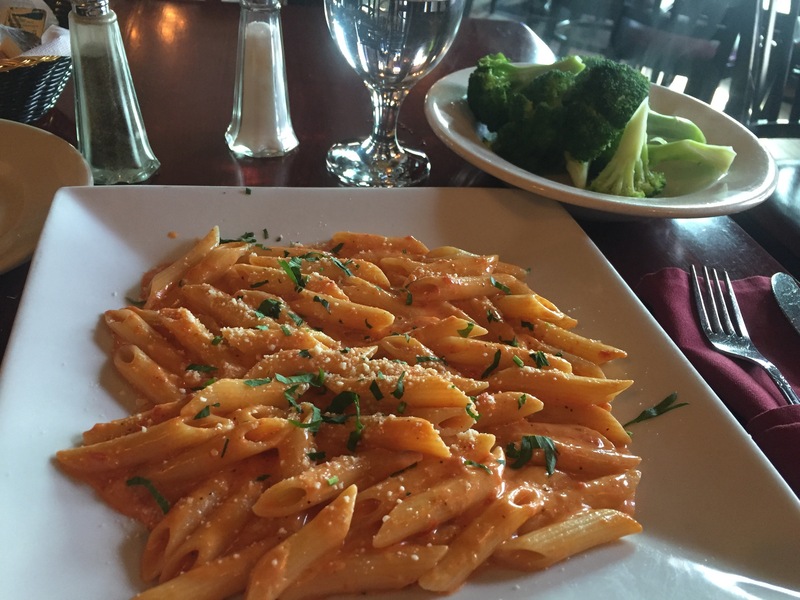 I ordered Penne alla Vodka with a side of steamed broccoli. I figured the big lunch shouldn’t be too “fat”, but fat enough. The sauce is amazing. It clings onto the noodles like the softest velvet. The tomatoes in the sauce are fat enough bits that you can taste them individually, and the cream sauce is a beautiful shade of pink, dusted with fresh basil ribbons and Parmesan cheese. The steamed broccoli acted as a clean counterpoint to the dish.